It was an ordinary day going to the mailbox to get my mail, but what I pulled out… WHOA?!! Ha! I’m sure the above sentence rings a bell (seems everyone is using that as a headline these days). 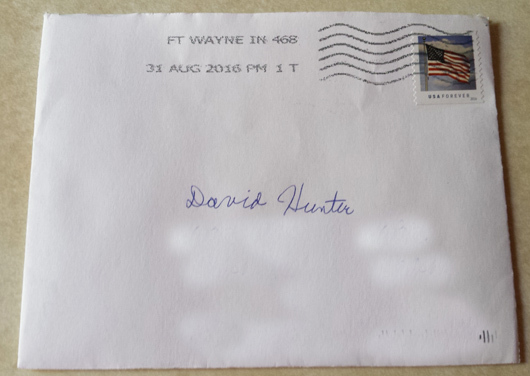 Anyhow, I got my mail and noticed a small handwritten envelope addressed to me using a real, stick-on stamp! Again, notice the handwritten address (in blue ink, well, just my name since I blurred everything else, ha) and the real stamp. When I flipped it over I noticed the return address and it was from a non-profit that I’ve donated to before, Feed The Hungry (You can check them out here: www.FeedTheHungry.org). So, what else could I do but rip it open?! A Handwritten ‘THANK YOU‘ Card!!! 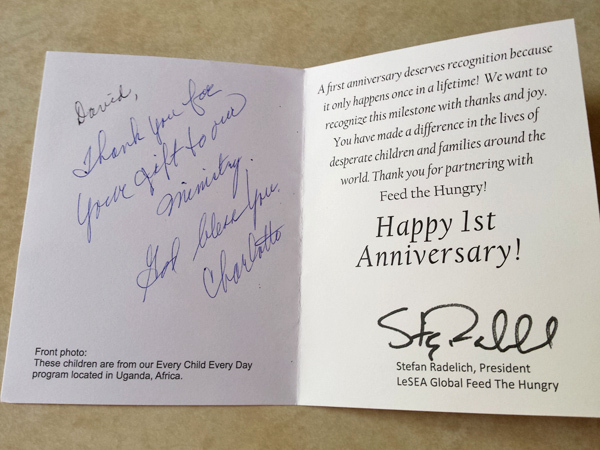 But I have never received a handwritten thank you letter from a non-profit before. 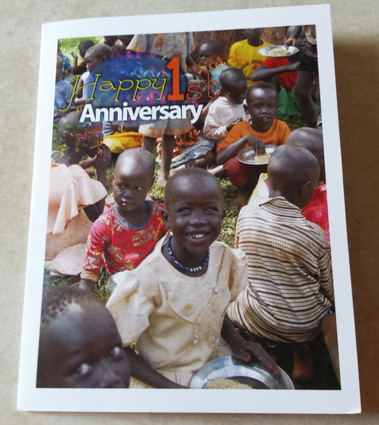 Hmm… Gee, you think if this non-profit can send out a handwritten thank you card don’t you think you could do it too? I’ve talked about sending out handwritten thank you cards a few times before. Why? Because I they really put you above everyone else. When I see other non-profits (or businesses for that matter) that I want to give to, don’t you think I’ll be comparing them to Feed The Hungry? You but I will. If this non-profit can handwrite thank you cards, then so can you! Handwrite the thank you card, duh! Don’t underestimate the power of handwritten thank you cards! Oh, and one thing I’d like to point out. I noticed my name was written in black ink while the rest of the thank you card was written in blue. Maybe there were multiple people helping out with these cards and added my name later, or it’s because they wanted my name to stand out. You decide. Oh, and comment below on your thoughts of handwritten thank you cards. Do you do send them to your customers and clients? How does it make you feel when you get one in the mail? One of your best David! And a great example of direct-response marketing. I read every word… it even gave me an idea for a current client! Thanks, Mike! I’m glad to hear you got a great idea for a client from the example.